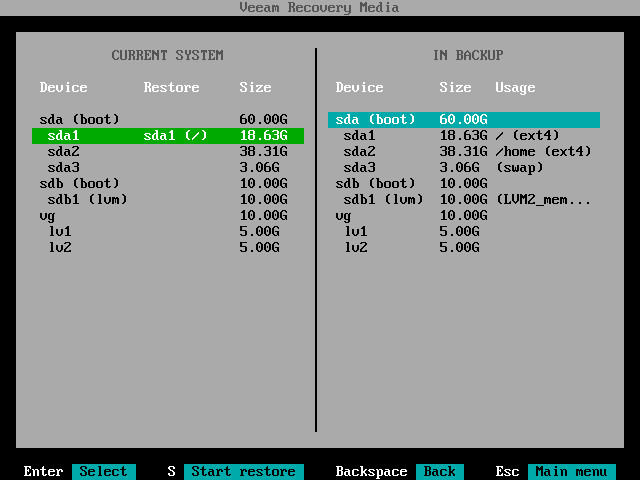 The Current system pane of the Veeam Recovery Media wizard displays a partition table of your computer booted from the Veeam Recovery Media. In this pane, you can select volumes on your computer which you want to restore and specify mapping rules for these volumes. If necessary, you can edit the disk layout before restoring volumes. In the Current system pane, select a volume on your computer whose data you want to recover and press Enter. Restore volume from — select this option if you want to recover the selected volume from the backup. 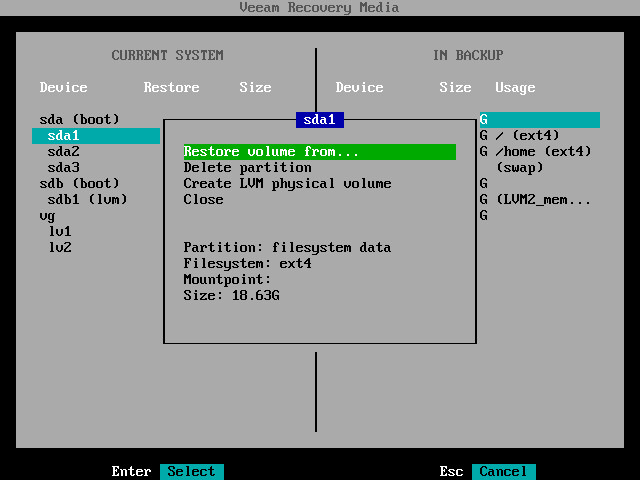 Delete partition [for simple volumes] or Delete volume [for LVM volumes] — select this option if you want to change the disk layout before restoring a volume. After you delete a partition or volume, you will be able to create a new partition or volume of the desired size and map a volume in the backup to the volume on your computer. [For simple volumes] Create LVM physical volume — select this option if you want to create an LVM physical volume on the selected disk partition. In the created physical volume, you will be able to create a volume group and restore to this volume group LVM logical volumes from the backup. Close — select this option if you want to close the window and select another volume. Select the Restore volume from option and press Enter. 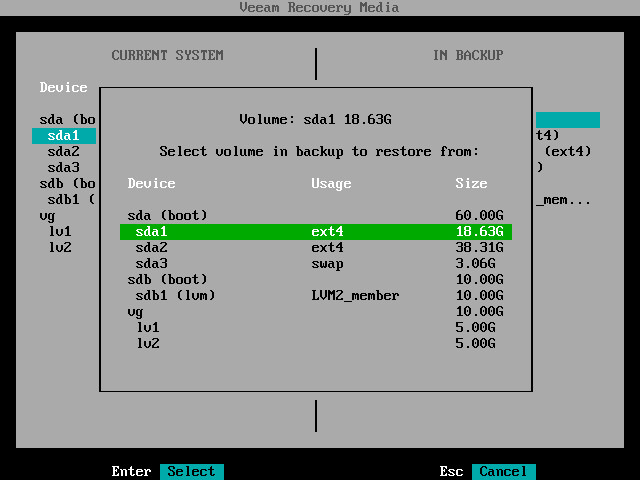 Veeam Agent for Linux will display a window with a list of volumes in the backup. Select the volume that you want to restore and press Enter. 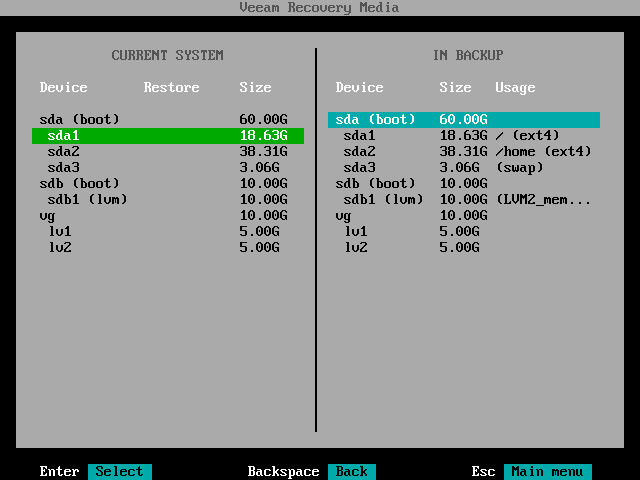 In the Current system pane, in the Restore column, Veeam Agent for Linux will display which volume from backup will be restored to the target volume. Repeat steps 1–5 for all volumes that you want to restore.